I have 6 metal prints leftover from my Krazy About Kona wall display. There are 6 in total and this is a one time offer. One size for each. First come first served. Click on the images below to purchase on my website or click here to visit Sale gallery. Click on the Buy Now button for pricing and to purchase. I was quite busy visiting the lava flow for a while back in August and September and then of course catching up on editing both photographs and video captured during those outings. It was great being able to ride the mountain bike most of the way and even right up to the lava flows at times. A few changes have been made to my website Fine Art galleries. The number of images has grown quite a bit over the years so, now I have the Volcano Fine Art images broken down into multiple galleries. 1 – 99, 100 – 199, 200 – 299, 300 – 399, 400 – 499, & 500 – 599. Newest images can always be found in the higher numbered galleries. Start with image #522 and work your way up to see the latest as of this post. Another big change is the separation of lava Fine Art from non-volcanic images. When you hover over the Fine Art Galleries menu you’ll see the additional galleries listed below the volcano ones. etc… Remember, you can always do a keyword search for a Fine Art image by its number. General keyword searches need to use one of the keywords posted on the Keywords page. You can’t use any random keywords. 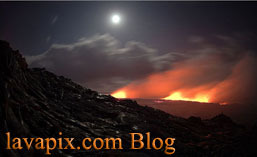 Images from my outings at the lava flows in August & September can be seen at these links. All images are available as prints or for licensing. Aug 2016 Lava 61g & Sept 2016 Lava 61g. Several new videos have been added to my YouTube channel since my last post. Both lava and non-lava. Start here and work your way back. New videos are added often so, best to subscribe to my YT channel for instant notification to new video uploads. Each video has a detailed description. Christmas is coming up quickly so, if you’re thinking of ordering a print for a present, best to do so soon. I can’t give an exact cut off date due to the many variables with orders.